Several years ago, Lucinda Fleeson packed up her comfortable life and English garden in Philadelphia and moved to Hawaii, the Extinction Capital of the World. Traditionally a reporter, Lucinda accepted a development position at the National Tropical Botanical Garden on the island of Kauai to work with Dr. Bill Klein (former Director of the Morris Arboretum). Her position came with a no-frills cottage (at first barely habitable) but it was set on the edge of a rainforest amid mango trees and bamboo groves teeming with geckos and visited by wild pigs. The ocean, lush green mountains, and rocky coves were just down the red dirt road. Not only do we get a glimpse of Lucinda’s life as she greets the challenges of this move and what she takes on personally and professionally, but we also learn about Kauai’s history, traditions, beaches, volcanoes, food, spiritual places, and especially its plant life and those closely connected to saving it. So much of what we think of as tropical Hawaiian plants are actually all introduced to the Hawaiian Islands and not native. While working at the National Tropical Botanical Garden, Lucinda learns that the native plants are dying at an alarming rate. Through her journey we meet plant hunters and propagators trying to save endangered flora and scientists studying geological and climate changes. 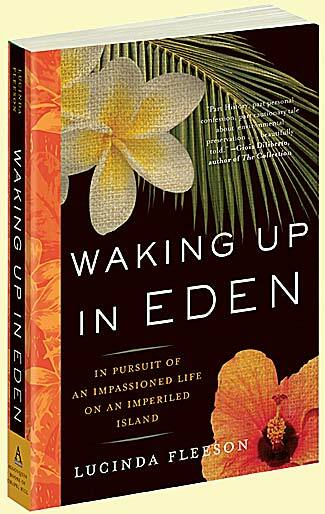 Waking Up in Eden allows us a glimpse into the inner workings of a botanical garden and to the mysterious, glamorous life of Robert and John Allerton as well as other historical characters that influence and inspire Lucinda’s own life. I’m adding this to my must-read list!! In addition to its portrayal of challenges to Hawaii’s native plants, this book is a funny and accurate description of the joys and treacheries of fundraising. Did I say funny? Yes, it is.